ECSI: Emergency Care & Safety Institute. Life-Saving Training. Simplified. 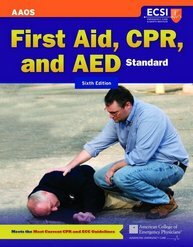 This manual is developed for use within First Aid, CPR, and AED training courses offered through the Emergency Care & Safety Institute. Coverage of the 2010 CPR and ECC Guidelines: Clear, concise direction on how to perform CPR and use an AED during an emergency. Current information on injuries and illnesses: Core information for first aiders presented in a clear and straightforward format. Skill Drills: Offer step-by-step explanations and visual summaries of important skills. Emergency Care Wrap-Up Tables: Provide a concise summary of what signs first aiders should look for and what treatment steps they should take. The Emergency Care & Safety Institute (ECSI) is an internationally renowned organization that provides training and certifications that meet job-related requirements as defined by regulatory authorities such as OSHA, The Joint Commission, and state offices of EMS, Education, Transportation, and Health. ECSI’s courses are delivered throughout a range of industries and markets worldwide, including colleges and universities, business and industry, government, public safety agencies, hospitals, private training companies, and secondary school systems. The Emergency Care & Safety Institute's training materials are developed and distributed by Jones & Bartlett Learning, our exclusive publisher. If you require technical support for any of our products, please click Proceed below to contact Jones & Bartlett Learning's Technical Support Team.